Pretty much the second the email hit my inbox to request a review of Mirror’s Edge Catalyst, I’ve been all over this game. 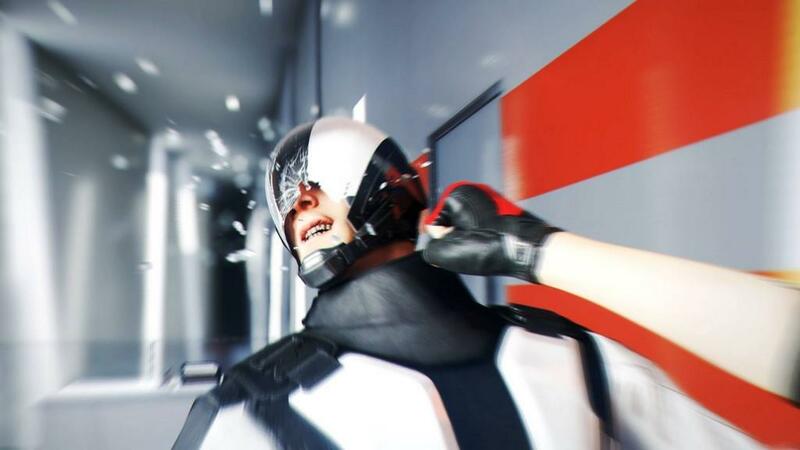 I greatly enjoyed the original game, if only slightly put off by its linearity, and then, when Mirror’s Edge Catalyst was announced, I could only offer up a slight, ‘meh’. Perhaps too much time had passed since slipping into the running shoes of Faith Connors, it has been almost eight whole years since the first game came out, how badly did I need an open world free-running game in my life? Turns out, pretty badly. I’ve been having a blast with this game, and with the story completed and a ton of side quests and a nearly maxed out Faith at my disposal, I think I’m ready to call this one. Serving as a prequel to the 2008 original, Catalyst follows a younger, brasher Faith, who’s got plenty of badditude to spare, eager to prove herself after getting out of juvenile detention (which the game casually suggests you get acquainted with by reading the Exordium comic books, on sale now at your local comic shop), Faith is back ‘running the Beat’ as it were, with her old crew, which, has added some new faces. Noah, the head of the cabal, and Faith’s father figure after the loss of her parents, is ready to get Faith back out and running again, along with clearing the air with her debt holder, Dogen. The story covers the events that eventually lead up to the timeline of Mirror’s Edge, but there still seemed to be a little ret-conning going on involving Faith’s sister, by the end of the game you’ll have an idea of what I’m talking about, and while it’s nothing particularly jarring, it still just seemed a little at odds with the original game. I’m also wondering what’s happened to all the friends, enemies, frenemies, that Faith has by the end of Catalyst, to not see some of them in a future adventure would be disappointing, as I was pretty fond of Plastic. Clearing the main story will take a little over eight hours, but the majority of your time post-story, will be given to clearing side-quests, running trials, and clearing any lingering content, along with generating some content of your own. 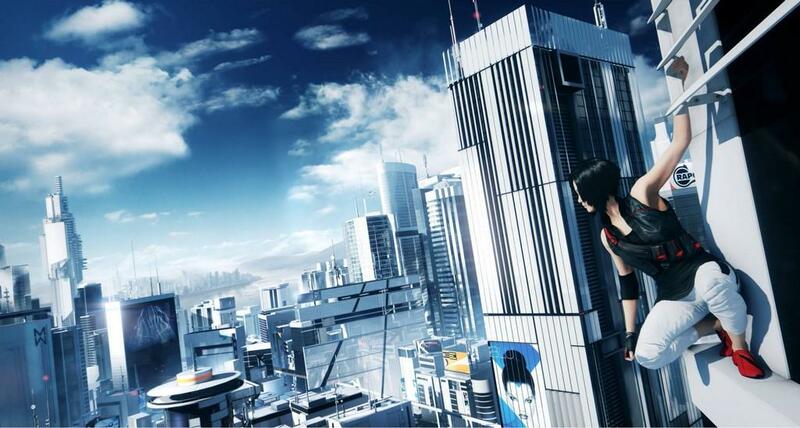 Mirror’s Edge Catalyst is all about the free-running experience, and the city of Glass in Cascadia certainly serves as an excellent playground, when it’s not trying to kill you. Falling off a building isn’t the only thing you should be worried about, standing still in Glass is a risky proposition as well, since there are GridPrint scanners everywhere, looking to report you to K-Sec, the security conglomerate that serves antagonist this time around. The game has a message about anti-corporatism, and how they aren’t always on the side of the people, and it’s kind of funny to see that by the end of the game, apathy ultimately wins as if to serve a warning, and so you’ll never escape the watchful eye of K-Sec, so keep running, it’s the best way to experience this game, and to stay free. The level design here is for the most part excellent throughout the missions, and just casually running through the city. There’s plenty of hidden items to collect, along with side-missions to complete, though they are nothing more than running from point A to point B within a very tight time limit. There are also some competitive runs that feature leaderboards for everyone to participate in. Setting up your own content to share is surprisingly easy, just place your waymarks as you move along the map, then once you’re satisfied, you can upload your creation to appear at random in other player’s games. There are also Beat L.E. markers that you can place, kind of like a personal calling card for when you find an out of the way spot to see if other players can tag it. Community is ultimately what will keep this game going after the main missions and replaying them has lost flavor. Thankfully, this game is pretty easy to pick up and play. The control scheme hasn’t been altered much from the original game, and Faith actually has a new item in her arsenal, a zip-line that can allow her to traverse wide gaps, or pull her up to some higher points that a normal jump won’t manage. The usage is sparse, so it feels like a cool moment when you have to use it, and it doesn’t do much to break the flow of running. There is a little bit of precision in some of the later levels that makes for tricky platforming, but ultimately, the controls wound up feeling a bit better than what I experienced during the beta. The lack of weight to Faith’s movements that I had noticed is definitely not a factor in the final release. Combat is a little wonky due to the canned nature of it, striking enemies has a certain timing to it, and it’s pretty easy to beat the enemy AI to a pulp, especially after unlocking the ‘Swap positions’ ability. What I really like this time around is the ‘Focus Shield’ a meter that builds as you run unimpeded, no breaks, or the shield goes away, but while you have it, you don’t have to worry much about the bullets flying in your general direction. The shield’s power can also be improved via unlocks in the skill tree. The unlock tree ultimately wound up being less restricting than initial reports made it sound, and by the time you’re reaching points where you need specific abilities, you’ve unlocked them long ago. Other beta concerns I had, revolved around the frame-rate throughout the city. This has mostly been resolved throughout the game with a few noticeable spots where the game always hitches, thankfully they aren’t in a high traffic area, but it’s still unfortunate to see that there are still some graphical issues. Nothing major, just texture flickering in some spots, though there is a persistent problem where the game takes time to load in assets, or the level of detail filter fails to deliver the higher quality models when you get up close. Color inversion is also a problem in some areas, so the game could have used a little more polish in terms of visuals, but the character models look excellent, and the city as a whole is very impressive, and one thing I really dig, is that as you run, Faith’s vision sort of clears, and you see more of the color of the world as a result of that, sort of like a runner’s high, which I thought was a nice touch. The audio is also stellar in this game, I’m really liking the minimalistic soundtrack provided by Solar Fields, and the sound design is excellent, and it’s some of the little things, even in death, the ragged breathing and world spinning as you fall kind of harkens to those old nightmares you had as a kid. And I can definitely recall that sinking feeling in my stomach all too well when looking down, and hearing the wind blow from the top of The Shard. After the story concluded, there was a scene that ended with Faith saying, ‘I’m gonna go run.’ That’s when I felt like the game had really opened up. The story content was more or less there to get you acclimated to compete against the other players out there. There’s also a major plot point left dangling, so maybe another ‘sequel’ will be in the works if this game does well? But as it stands, Mirror’s Edge Catalyst is pretty much everything gamers would have hoped it could be. The open world is really a game-changer for this series as a whole, since it really puts the freedom of the players at the forefront, able to choose their own path. I’m hopeful that we’re not left waiting another eight years for another entry in this series, but if it doesn’t come to pass, hopefully the community can keep this game thriving with fresh content and runs. The wait has been worth it, Mirror’s Edge fans, it’s time to get out there and run. The running and gameplay of Catalyst are top notch, and the game definitely benefits from the new locales. There are some minor graphical issues that kind of add up over time, but overall, this game has been worth waiting for.